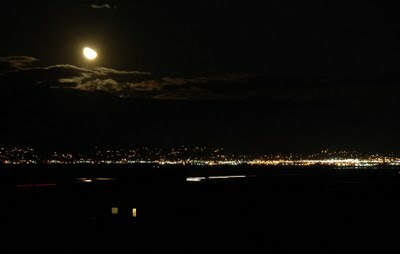 Three-quarter moon over Logan, Utah (2009). Image © Ted Pease / Peezpix. "According to the known laws of physics, the past and the future should be exactly the same." "The future of the universe may be traveling back in time to meet us." "Time may not be what we think it is. And all of eternity might already exist." -Through the Wormhole (The Science Channel). In storybooks and fairy-tales, myths and movies, we expect the highlights of a narrative to follow ups and downs, conflicts and catharses, resolutions and denouements. There are recognized patterns of fiction: almost every story, everywhere in the world, written in any time period, follows thirty-six models listed here. Similarly, Christopher Booker won attention in 2005 for a book entitled, The Seven Basic Plots, in which he argued that there are only seven stories: overcoming the monster; rags to riches; the quest; voyage and return; comedy; tragedy; and rebirth. These formulas imply that the human mind wants the world to follow a predetermined sequence of plot devices. In the modern myths of comic books and other story-telling media, these anticipated and often mandatory plot points are called 'beats.' These patterns are part of what the Berlin School of Experimental Psychology defined as a human urge toward completing a fragmented or fractured picture in reality, a Gestalt psychology. When the psychological pressure of those narrative demands is applied to reality, we get into trouble. In cinema, 70 years of real life beats are routinely condensed into two fictional hours. On television, the time frame is likely 30 minutes to one hour. Maybe we can in truth only bear to have things work according to plan for short durations. All the same, movies, television, comics, novels and other modern narrative forms have socialized the bulk of the modern public. Do people expect the beats of real life to arrive faster than they should? Or do they wrongly expect them to arrive at all? If one's life does not follow the expected 'story,' there can be tremendous pressure to make real life conform to fictional structures. When real life does not follow the prescribed story, a great deal of social anxiety and individual stress can result. In truth, real life in the real world offers a much less linear course of time and action. Today, when everything changes so quickly, when the Internet attention deficit disorder blinkfest meets consumerism built on accelerated and planned obsolence, some analysts have decided that living in the eternal now is the answer. Living in the present is the magic bullet for depression, confusion, indefinable subliminal grief, identity fugues, uncertainty, aporia, anomie - that raft of silent, hidden problems which nag away at individual and collective well-being - as we make and remake reality every single day. The alternative metaphysical path is the recommended surrender to the infinite, the yogic embrace of eternity. Merge with everything, accept the all. Then one's individual concerns do not seem important. There must be a middle way: some path between deliberate self-entrapment in the now and an endless mental horizon. That middle way depends on being able to look continually at the 'big picture' of life, while not forcing that big picture to make a coherent picture at all. Making sense of personal histories, looking back and suddenly seeing meaning and trends in past events, neither sets one on a life story heading for a predetermined future; nor is the past fixed in stone. We always have the option in the present moment to reinterpret the past, or to understand its meaning in terms of future events which have not happened yet. A psychology of fluid time would mean that individual lives never follow a single basic plot. Rather, they are always all the basic plots at once. Moreover, the dominant big picture of one person's life can transform thousands of times per day on the briefest and slimmest of contingencies. Every tragedy can become a comedy. Every quest can kill a monster. Every rebirth can mark a point of departure on another voyage. This escape hatch from the past and present is known as liminality. Thanks for your comment Paul, all true, and well put.